I plan to get my feet into the cold and muddy waters of robotics. Of course, assembling the :move mini with the bulldozer add-on will be nothing great, but I’ve craved to find out how to control a servo and how to put some life into the boring aspects of programming. Just kidding. But blinking LED and measuring values is nice, but … I want to build my own cat-feeder. Or at least something which moves and blinks to keep them a bit attracted. And: the micro:bit and Calliope mini feature both Bluetooth-radios, so connecting them shouldn’t be a problem. Another advantage: somehow the given libraries for the micro:bit are more advanced and diverse than the Calliope’s, could be due to the release in 2015 versus 2017. 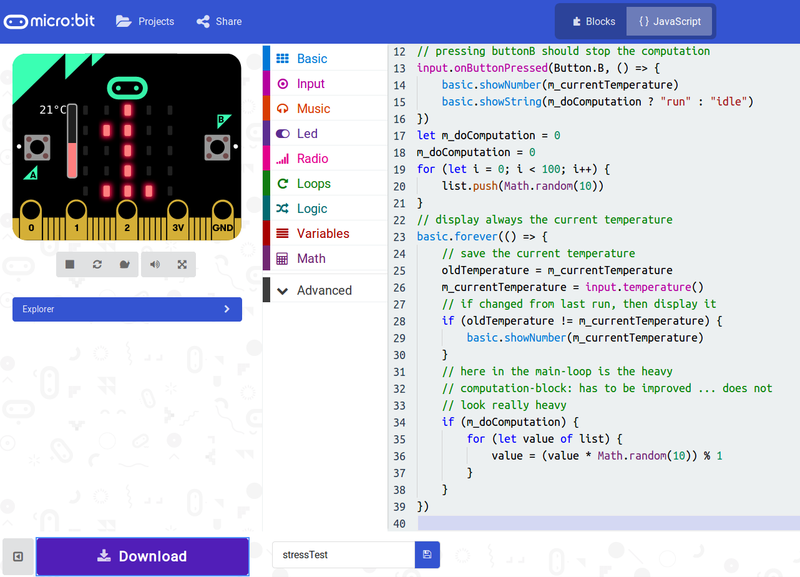 Also: micro:bit features microPython. C not ..
My first idea was to create a stress-test. Play a bit around with the buttons and the “run in background”-feature. Still not heating properly and fast enough.